Beautiful Lakeside Setting Adjacent to the Shopping and Dining at Bradley Fair. 2041 North Bradley Fair Parkway. 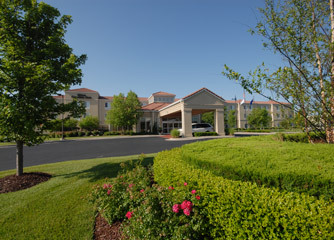 Hilton Garden Inn - Wichita is in the beautiful Lakeside Wilson Estates-Bradley Fair Office Park and Retail Development. Our property was specifically designed to cater to the needs of today’s traveler. We are pleased to offer our clients the conveniences of both home and office – while on the road. For guests requiring overnight accommodations, you’ll be pleased to recommend our well-designed guestrooms. Each room has a hospitality center that features a refrigerator, microwave and coffer maker. Experience our European style comforter with duvet cover, crisp white linen with an assortment of pillows. Each room offers an oversized work desk with halogen lighting and ergonomic chair, hairdryer, iron / ironing board and curved shower rods with Han Grohe pulsating shower heads. “The Garden Sleep System”, designed exclusively for Hilton Garden Inn Hotels, is now available in all the King Bed rooms. One of the most comfortable beds you will ever experience, this revolutionary bed is created from a system of air baffles and flexible wooden slats. The system contours to your body by displacing air based on your weight and shape. On each side of the bed, a dial adjusts the firmness of the mattress, creating a personalized comfort zone for each individual guest. The Great American Grill, featuring indoor and seasonal outdoor seating, offers an outstanding breakfast buffet, as well as, lunch and dinner menus. Room service is available in the evenings. The Pavilion Pantry conveniently located near the front desk carries a variety of microwavable foods, beverages (including soda, milk, beer & wine) and sundries. Other hotel amenities include an indoor pool, whirlpool, exercise facility and an outdoor walking path around the lakeside landscaping at Bradley Fair. The Bradley Fair Development offers over 50 premium stores in and open air plaza ideal for strolling.